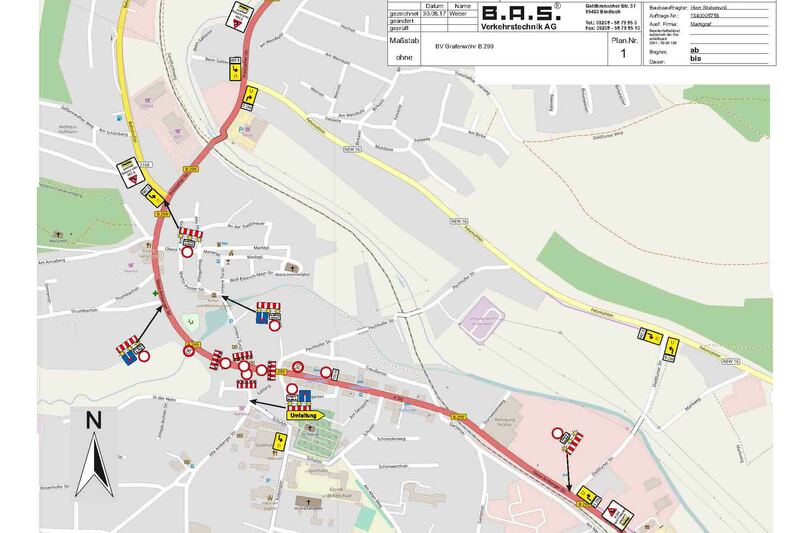 GRAFENWOEHR, Germany — The city of Grafenwoehr conducts critical road resurfacing at the city’s central intersection of B299 and Alte Amberger Strasse during the week of Sept. 25 – 30. This is the intersection with the traffic light outside Tower Barracks Gate 1. No vehicular travel through the traffic light intersection at this time. While this may be an inconvenience, city officials assure that construction is necessary. Community members should use the alternate route through Felsmuehlstrasse (see map) for travel across the affected area. Gate 1 and Gate 3 remain open. For vehicle access to Alte Amberger Strasse, the strip that leads to Gate 1, traffic must follow posted detour, or Umleitung, signs through residential roads. Access to the Grafenwoehr Rathaus, or City Town Hall, and Military Museum, is only possible via Obere Torstrasse (across from Pizzeria Santa Lucia).